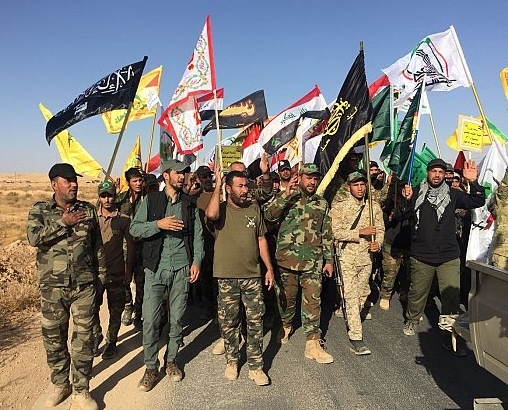 The Popular Mobilization Units (PMU) or Hashd al-Shaabi in Arabic, formed in 2014 following a fatwa by Grand Ayatollah Ali al-Sistani, played a major role in countering the expansion of the Islamic State and in bringing about its ultimate demise in Iraq. As the Islamic State was officially defeated in Iraq late last year, the future of the PMU is subject to many debates. An examination of the genesis of these forces and their relationship with the Iraqi State is essential to foresee what Iraq may look like following the parliamentary elections in May. Sectarian divisions in Iraq have been brazenly instrumentalized by Saddam Hussein, the American administration, and today, Iran. This process exacerbated tension between Sunni and Shia Arabs, the two main communities of Iraq, who were caught up in the rivalries between regional and international powers in the Middle East. As their rivalry grew, Iraqi institutions weakened, which led to the advent of an Islamic “caliphate” occupying more than a third of Iraqi territory. In this context, and following the collapse of Iraqi forces facing the Islamists, the grand ayatollah al-Sistani pronounced his fatwa on June 13, 2014. This announcement occurred a few days after the fall of Mosul and one day after the Camp Speicher massacre, where more than 1,600 Shiites were executed by jihadists. Consequently, several preexisting Shia militias answered the call, and thousands of volunteers enrolled in related factions simultaneously. Among the main units are the Badr Organization (the oldest, founded in Iran in 1982 and currently led by Hadi al-Ameri), Asaib Ahl al-Haq, the Khorassan brigades, the Hezbollah al-Nujaba Movement, and the Hezbollah Brigades (the two latter factions unrelated to the Lebanese Hezbollah movement although sharing a similar ideology). These militias are some of the most powerful military forces within the Hashd al-Shaabi and rely on Iran’s military apparatus for their training and funding. They also share a “Khomeinist” ideology due to their allegiance to the Iranian religious authorities and their ambition to impose the Iranian political system in Iraq. In doing so, they draw their inspiration from Twelver Shia jurisprudence and the concept of Velayat e-Faqih. Iranian influence is rendered even more obvious due to the involvement of Qassem Soleimani, senior military officer of the Iranian Revolutionary Guard Corps, who directly supervises the military operations of several Shiite militias on the ground in Syria and Iraq in their fight against the Islamic State. These forces are followed by organizations such as the Abbas Division and the Ali al-Akhbar Brigade, both of which are affiliated with Grand Ayatollah al-Sistani. They receive funding, arms, and training from Iraqi forces. They are also multi-confessional as they include between 15 to 20 percent Sunni fighters within their ranks. Other units include those close to Imam Muqtada al-Sadr, whose main faction is the Peace Brigade (Saraya al-Salam). The Sadrist movement is characterized by its quietist ideology and its ambition to strengthen central power and Iraqi institutions, as well as including other minorities of the country. This has led it to reach out to leaders and populations in Sunni strongholds of Iraq in a attempt to balance the dominant Shi’i political and military forces that follow a more sectarian agenda. This range of militias gives us an overview of the ideological variation among different groups that comprise the PMU; from pro-Iranian elements to the Sadrist movement, various PMU factions hold contradictory political visions, which sometimes leads to direct confrontation. Aware that the Hashd did not sufficiently represent other communities of the country, Iraqi authorities encouraged several non-Shia militias to join the coalition. Those militias include the Babylon Brigades (a militia of mixed ranks, some of whom are Christian), and several Sunni militias including the Nineveh Guard, the Salaheddin Brigade, and the Tribal Mobilization Forces. We also find factions representing smaller minorities such as Yazidis (several local battalions in Sinjar) and Shabak (Liwa al-Shabak). In total, the PMU are composed of roughly 90,000 active combatants between the different factions. Despite numerous violations of human rights, and even alleged war crimes, the combat efficiency of the Hashd al-Shaabi has prompted the International Coalition, led by the United States (or the Combined Joint Task Force), to train, arm and fund several militias in conjunction with their effort to restructure the Iraqi army. Taking advantage of the political and military vacuum, the PMU soon became the strongest force on the ground opposing the jihadists, which raised some serious questions regarding their relationship to the state. Indeed, according to a Weberian perspective, the state should maintain a monopoly over the use of force. A paramilitary organization composed of several factions, some of them having transnational ambitions, risks threatening the unity and cohesion of the Iraqi State, which has already been seriously eroded by the instability that has prevailed since the U.S. invasion. The sectarian identity of these groups, along with their ambiguous relationship with Iran, has raised concerns among experts observing the situation. Nevertheless, the election of Prime Minister Haider al-Abadi in September 2014 has allowed the country’s institutions to strengthen and has challenged the prognosis of the inevitable implosion of Iraq or redefinition of Middle Eastern borders. By a decree in 2016 that integrated the Hashd al-Shaabi within the army, al-Abadi affirmed his dedication to turn Iraq’s military campaign against IS into a national struggle, reducing the risk of future inter-confessional war. Despite this official allegiance, some units, including those who collaborate closely with Iran, have shown their intention to remain independent and have tried to emancipate themselves from governmental authority. Al-Abadi’s government was fully aware that the militias might try to overstep their mandate once IS was defeated and he therefore insisted that all groups lay down their weapons once victory was announced. He received support from Shiite religious authorities as well as other leaders, including Muqtada al-Sadr. Unfortunately, the militia groups have not complied with his order thus far. Indeed, the victory over IS, officially announced on the 9th of December 2017, did not soften the ambitions of several militias to continue operating freely on the ground, justifying their activities by pointing at the presence of IS sleeper cells or referring to the potential rise of new terrorist organizations. A spokesperson of the Hashd al-Shaabi, Mr. Abu Mustafa Imami, deputy-commander of the Popular Mobilization Force of the Northern-Iraq frontline, also insisted that only a new fatwa from the Grand Ayatollah could induce the militias to demobilize. Beyond this, prior to rendering their military equipment to the government, many militias would like a guarantee that they will be able to integrate their soldiers into the regular forces or benefit from pensions for veterans if they decide to go back to a civilian lifestyle. It is certain that subsequent compensation as well as a serious integration policy must be implemented to prevent a worst-case scenario like the one that led to the civil war following the American invasion of 2003. Disarmament, demobilization, and reintegration of the militias are the main challenges that beset Iraq’s future. To be more effective, they must be followed by a reconciliation policy as well as judicial mechanisms for serious cases of human rights infringements. In 2004–2005, the failure of such a process led to the bloody clashes that have affected Iraq in the last twelve years. Pending this outcome, some militias that are supported by powerful political parties keep trying to interfere in the internal politics of the country in order to ensure their survival. This strategy had already been observed earlier, as when in 2014 a Minister of Interior was appointed who served the interests of some militias. Some PMU are now eyeing the coming parliamentary elections to be held on May 12 of this year. Legally speaking, militias cannot present any candidates, hence many military leaders with political ambitions have resigned in order to participate in the elections. Some have united into an important coalition called the “Mujahiddin Coalition,” later rebranded the Fatah Alliance. It could play an important role in the elections. “PMUs are waiting to see in which direction the wind is going to blow to align themselves with the candidate that has the best chances of representing their interests in parliament,” explains Dylan O’Driscoll, expert and researcher at the Humanitarian and Conflict Response Institute. The temptation is indeed strong for some actors to attempt to interfere in al-Abadi’s policy of strengthening government institutions. Within the Prime Minister’s own party, the Da’awa movement, former Prime Minister Nuri al-Maliki has the support of the Asaib Ahl al-Haq militia against his rivals. Many consider al-Maliki responsible for the exacerbation of inter-sect tensions that led to the disaster of 2014. He also relies on a vast web of patronage relations characterized by its corruption and sectarian nature. Meanwhile, the Sunnis, disorganized by the fighting that marked the areas where they reside, are calling for a postponement of the elections in order to allow for a return of IDPs to ensure that their votes will be included. Some of their representatives are calling on al-Abadi to split his party in two in order to join him in a truly multi-sectarian coalition. In recent months, political coalitions have formed and fallen at a high rate, sometimes leading to unusual situations: two leaders from the same party are running on two different lists and Shia movements are allying with communists. Recently, Haider al-Abadi’s coalition (having engaged his campaign under the motto of inclusion, strengthening state institutions, fighting for justice, and working against corruption), paradoxically struck a bargain with the Fatah Alliance, producing harsh criticism from Muqtada al-Sadr. But this alliance did not last more than three days, which shed light on the limits of al-Abadi’s popularity. Beyond intrigue, the main issue is to determine whether alliances between the militias’ pressure groups and the politicians will facilitate the PMU’s integration within Iraqi institutions, notably the military, or whether it will have the opposite outcome, generating further instrumentalization of those institutions by actors under foreign influence. The PMU are henceforth a central piece in the Iraqi political milieu and even more so within the internal rivalries among various Shiite political figures. The victor of this power struggle will be in position to determine the evolution of post-IS Iraq. The question is whether communitarian fault lines can be eased, sectarian militias be demobilized, and institutions strengthened in an inclusive manner. It seems clear that the cessation of foreign interference would be the first step towards such an outcome. This is the English version of a French article published February 6, 2018 in OrientXXI. Sylvain Mercadier is a political Science graduate from St-Joseph University (Beirut, 2014), spent many years in Middle East including Oman, UAE, Lebanon, Palestine and currently resides in Iraqi Kurdistan, frequently writes for OrientXXI. Araz Muhamad Arash is an Iraqi journalist who writes for Iraq Oil Report and Awena, specializing in insurgency movements and paramilitary organizations. It should be noted that the training of paramilitary militias, a process that was supported by the Iraqi parliament through a decree introduced by former Prime Minister Nuri al-Maliki is illegitimate according to article 9 of the Iraqi constitution. This number was given to us in an interview by Abu Mustafa Imami, deputy-commander of the Popular Mobilization Force of the Northern-Iraq Frontline. Interestingly enough, this argument is not unanimously shared amongst the Hashd. Another spokesperson that we interviewed, Mr. Sayyid Ali Hashim, representative of the Hashd al-Shaabi in Tuz Khurmato, insisted that the parliament is the legal body that must decide the fate of his coalition. This is even more surprising as they are both from the same militia, the Badr Organization. They also differ on the danger that the so-called “White Flag” organization might represent (a rebel group that appeared recently in the outskirts of Tuz Khurmato). The former sees it as an existential threat to Iraq’s stability, the latter as an inoffensive organization. Interesting, informative, how “Murphy’s Law” turned into the dominant player, thanks to the ineptness(?) or brilliant plan from the outset? The U.S. certainly is responsible for the ongoing hostilities, as well as the drain of resources from the treasuries, both in the war zone as well as from the U.S.A. itself. Considering all the different proxy masters involve, there doesn’t seem to an end in sight anytime in the near future, regardless of any outcome to the upcoming election. The article assumes the West wanted to remove assad. There was never any intention to topple Assad just the destruction and division of Syria. This was an easily achieved aim because America (and Israel) knew exactly how Assad would behave. They knew Assad did not have the cognitive ability to find a solution. Assad has not won, he was allowed to stay in power. Two superpowers agreed on this but they cannot seem to agree on the details. He is a perfect dictator for Israel. It is ridiculous to keep saying Assad has won when he has lost half of the country and destroyed the other half.